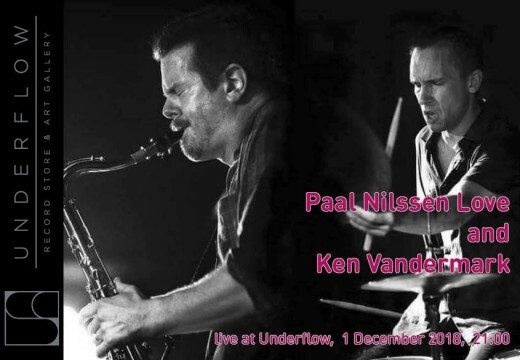 Saturday 1/12/2018 Paal Nilssen Love & Ken Vandermark live at Underflow! Το Underflow record store & art gallery φιλοξενεί τους Paal Nilssen Love(ντραμς- κρουστά) & Ken Vandermark (σαξόφωνο- κλαρινέτο) ,το Σάββατο 1 Δεκεμβρίου για ένα μοναδικό live στις 21:00. Το δυναμικό ντούο με 20 χρόνια στον χώρο της μουσικής, διακρίνεται από στοιχεία ελεύθερου αυτοσχεδιασμού και έντονου ρυθμού. Η συνεργασία αυτών των δυο μουσικών έχει σαν αποτέλεσμα την έκδοση 9 άλμπουμ εξαιρετικής με ευρεία γκάμα αυτοσχέδιας και δυναμικής μουσικής. Οι συνεργασίες κατά καιρούς και με άλλα καταξιωμένα γκρουπ όπως τους Peter Brötzmann Chicago Tentet τους Lean Left έχουν υπάρξει μοναδικές και εξαιρετικά βοηθητικές για την μετέπειτα μουσική τους καριέρα και εξέλιξη. Underflow record store & art gallery presents Paal Nilssen Love (drums & precussions) & Ken Vandermark (saxophone & clarinete) for a unique live on Saturday December the 1st at 21:00. This dynamic duo with over 20 years in the music field, stands out due to its free improvisation and its dynamic rhythms. The collaboration of these two musicians has as a result the put out of nine albums of exceptional music. They have also made some collaborations with one of a kind groups like Peter Brötzmann Chicago Tente and Lean Left along with others, have been extremely helpful for their future sounds and musical carier. Ken Vandermark (Saxophones & clarinets) is an American jazz composer, saxophonist, and clarinetist. A fixture on the Chicago-area music scene since the 1990s, Vandermark has earned wide critical praise for his playing and his multilayered compositions, which typically balance intricate orchestration with passionate improvisation. He has led or been a member of many groups, has collaborated with many other musicians, and was awarded a 1999 MacArthur Fellowship He plays tenor saxophone, clarinet, bass clarinet, and baritone saxophone. Paal Nilssen-Love - (Drums & Percussion) was born in Molde, Norway, and raised at a jazz club in Stavanger, run by his parents. It was natural to choose his fathers drums as his instrument and jazz as his work. From 1990 on he took actively part in the jazz milieu in Stavanger and joined bands with established musicians such as trumpeter Didrik Ingvaldsen and saxophonist Frode Gjerstad. In many ways, these collaborations were essential as they pointed out the directions for Paal’s later musical development and career.